CARE India considers disaster preparedness and response as a critical aspect of its organisational mandate and has a ‘Disaster Preparedness and Response Strategy’ in place. 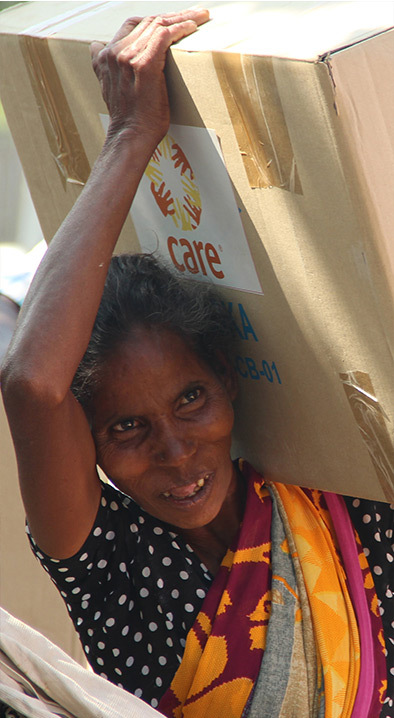 CARE India also maintains Emergency Response Teams at National and State levels in the country to be able to make timely decisions while deploying trained team members and of relief items stocks during emergencies. Throughout the year, CARE India partnered with various states to build their capacities on disaster preparedness and response, and carried out quick emergency response. Studies and work evaluations were also conducted this year to strengthen future intervention designs. 02 1,01,900 people engaged through online and field activities through CARE India’s flagship ‘India Prepares’ campaign, organized to spread awareness on disaster preparedness across various states. 06 4,760 people benefitted during Cyclone Hudhud response. They were supported with shelter repair and cash transfers. Mayalakshmi was always determined to support her family financially. Having learned the technique of de-shelling cashew from her parents at a very early age, she had the confidence to start her own de-shelling center. She motivated her husband to help her start a manual cashew de-shelling unit in the front yard of their house. After the first two years of hard work, Mayalakshmi could save enough to purchase two de-shelling machines and a small drier, and this helped her to increase production.